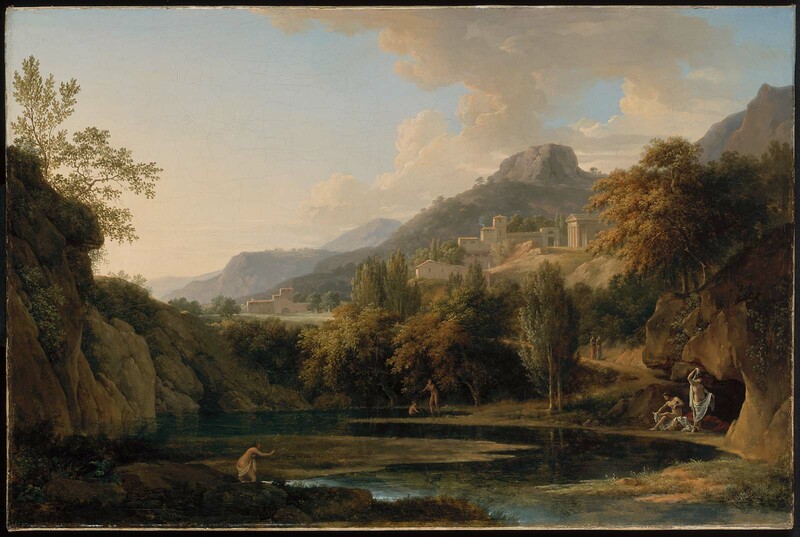 Born in Toulouse, Valenciennes lived and worked in Rome from 1777 to 1784, and he brought back to Paris sketchbooks and oil sketches that would provide the raw material for many later landscape compositions. He sought to raise landscape painting to the respected level of history painting— the depiction of events from mythology, ancient history, or the Bible. Here, the bathers pose like antique sculptures, evoking an idyllic Roman past. Possibly the painting by Valenciennes described as "View of Italy, with Young Women Bathing" (Vue d'Italie, avec de jeunes Filles qui se baignent), measuring 58 by 86 cm. (1 pied, 11 pouces; 2 pieds, 10 pouces), exhibited at the Paris Salon in 1791 and lent by Mme. ... (name withheld). See "Explication des Peintures, Sculptures, et Gravures de Messieurs de l'Academie Royale" (Paris, 1791), pp. 26-27, no. 132.